It’s been 6 months since the CONSOB Regulation enabling equity based crowdfunding was introduced in Italy. This was a significant event as it made Italy the first country in Europe to formally introduce equity-based crowdfunding into the national legislation. It seems that there has been a great deal of debate and apparent activity without a great deal actually being disclosed or indeed to show – “tanto fumo e niente arrosto” as Italians would say (“all talk and no action”). We can leave the issues of an apparent lack of transparency for another day but it is right and proper to ask – after six months exactly where are we with equity crowdfunding in Italy? The regulation officially went into action at the end of July and inevitably, before we could expect to see offers popping up on the web and investors investing millions in them, there needed to be platforms in place to handle the offers. According to the Regulation, embryonic platforms need formal approval to operate via an application to Consob, the national financial authority, in order to be authorised and included in the portal owners registry. Who can open a platform? Individuals and institutions who meet the integrity and professionalism requirements set by Consob, who can be divided into two groups – those seeking registration for the first time, who are required to undergo a registration process, and those that already have certain financial approvals in place – like Banks and financial intermediaries – who can be placed on a special section of the registry. This later group must simply inform the CONSOB of their interest in becoming crowdfunding platforms. Such bodies are in effect pre-approved but they must wait to be officially included in the special section. Perhaps surprisingly, the first equity platform to be included in the registry was one that had to complete the full approval process and is called StarsUp, listed in October 2013. This was followed by Unicaseed, a platform operated by Unicasim, a financial intermediary firm, who curiously enough had to wait a bit more to see its portal first in the special section of the registry. So far so good, two platforms registered, question is how are they doing? Unicaseed, as we announced, launched their first offer on the 31st of December with Diaman Tech Srl, a spin-off of the Diaman Holding group. The innovative startup is developing a financial analysis software and it’s seeking €147,000 (18.92% equity). The offer is currently under due diligence from an institutional investor until the end of this month. Starsup launched this week, with Cantiere Savona Srl, a young startup developing an innovative and sustainable concept for yacht. The three young founders are seeking €380.000. The offers will close after a period of (respectively) 3 and 4 months, therefore between end of March and end of May we will know the fate of these two pioneer experiences. We also need to acknowledge the pioneering platforms, who are to be applauded for their innovation. Whilst they may not perhaps be blazing a trail, they are certainly breaking new ground and setting the tone for those that follow. And they are doing so with the help of the crowd. Leonardo Frigiolini, CEO of Unicaseed, told us that they are learning a lot from the people who have started using their portals and who are sending lots of suggestions for improvements, that Unicaseed team are carefully taking into account. For a traditional brokerage company such as Unicasim, this is a totally new way to operate, and whilst crowdsourcing may seem familiar to many of us, for firms in the established and conservative world of financial service we should applaud their courage and vision to adopt such novelty into their operations. Are we perhaps witnessing the beginnings of wider innovation in the traditional financial marketplace through these little things? What is puzzling is the lack of other platforms. In the latest Analysis of Italian Crowdfunding Market (carried out with Ivana Pais) 9 equity platforms were identified as being in their launching phase, but so far only two have launched. To try to understand what was happening and why there seemed to be such a delay we had a chat with some of the aspiring equity portal managers. What we found that key issues are – perhaps predictably – compliance issues and satisfying these requirements and translating the articles of the regulation into a real portal. It’s also worth remembering that these embryonic platforms are, in many cases, startups, and funding the costs associated with compliance can certainly take time. Many commentators in the media translate this delay into a message of “the regulation is too rigid” but the protagonists don’t always share this view, even those that are finding the approval process quite a protracted and painful one. On the question whether it’s easy to become an equity-based crowdfunding platform or not, the general answer was ‘no’ and it was generally answered with another question: Should it be? “The entrance in the sector of a good number of operators (at least 10) would be positive and it would contribute to make the tool credible. However opening the process to anyone without regulations would mean to put the growth of the sector and the protection of investors at risk”, says Carlo Piras, co-founder of Starsup. An interesting development emerged when we had the pleasure to participate at a round table organised by LUISS, the eminent University and Business School in Rome and co-organisers of the most recent edition of crowdfuture. The meeting was to publicise a project entitled DREAM which may well have a significant impact on the emergence of equity crowdfunding in Italy. The Luiss DREAM (Diritto e Regole per Europa Amministrazione e Mercati – Law and Regulations for Europe, Administration and Markets), is the new research centre of the Law Department of the University, directed by prof. Gian Domenico Mosco. The acronym which forms the name can be interpreted in English as it is in Italian and encapsulates the aim of simplifying the legal and regulations, and one of its objectives would be to create accessible legal resources for startups wishing to collect risk capital through online portals. 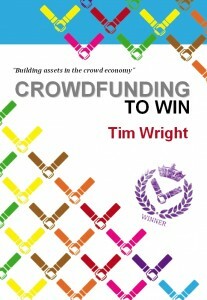 An interesting and ambitious project adhering very much as it does to principles of democratising capital. As a final point to conclude this overview of the state of equity crowdfunding in Italy six months on from its enabling, we must acknowledge an example of Italian equity based crowdfunding project that decided to go abroad. It’s the case of GlassUp, an Italian startup who already completed a reward based crowdfunding campaign on IndieGoGo in June 2013. Now they are seeking to raise £100,000 (7.69% equity) on the UK-based equity crowdfunding platform Seedrs. We asked then why did they go abroad? According to Francesco Giartosio, CEO and founder of GlassUp, they felt they wanted to try an equity round where there was already a track record of successful funds. But this does not mean it’s the easiest and most convenient solution (for example, if they are successful they will have to create a UK legal entity because Seedrs only admit British startups). Whilst this could be viewed as a loss to Italy it should be remembered that such a move doesn’t exclude the possibility of another round on an Italian platform at some point in the future. So, a lot of irons in the fire in a relatively short period of time. But, as it’s true for the Eternal City, democratisation of capital shall not be build in a day. Great article, thank you. We have a crowdfunding platform solution for Italy ready but have not had any luck finding partners in Italy yet… we even speak Italian, but the traction has been slow so far.. hopefully that changes soon!